Adjustable up to 8 feet tall. For 10 foot backdrops, click HERE. Choose width on order form. Swag means you'll have one layer of drapes hanging straight down, and another layer of styled drapes. To learn more, see How To Choose Backdrop Size and What is Swag? 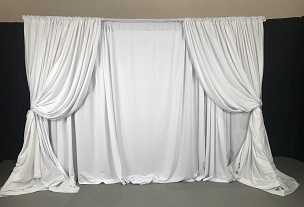 Drapes are available in a variety of colors. 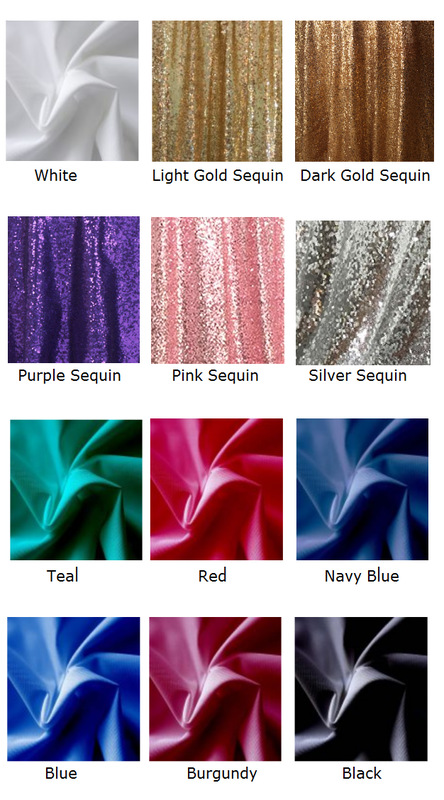 Click HERE to see color options. STRING LIGHTS add white twinkle effect. UPLIGHTING makes entire backdrop glow in any color. Chandeliers add a touch of elegance! Just hook it onto the backdrop. To learn more, click HERE.